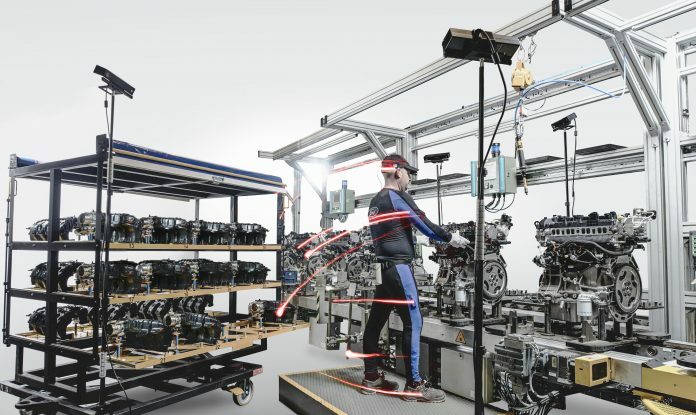 Workers at Dearborn-based Ford Motor Co.’s Valencia Engine Assembly Plant in Spain are using a special suit equipped with advanced body tracking technology to record how assembly line workers move. Ford plans to use the results to design less physically stressful workstations. The technology is typically used by professional athletes to track their movements for training purposes or ensure their skills are accurately replicated in video games. The pilot system for Ford was created by the automaker and the Instituto Biomecánica de Valencia and tested by 70 employees in 21 work areas. Engineers were inspired by a suit they saw at a trade fair that demonstrated how robots could replicate human movement and applied the idea to their workplace, where production of the new Ford Transit Connect and 2.0-litre EcoBoost Duratec engines began this month. The skin-tight suit consists of 15 tiny movement-tracking light sensors connected to a wireless detection unit. The system tracks how the person moves at work, highlighting head, neck, shoulder, and limb movements. Movement is recorded by four specialized motion-tracking cameras, similar to those usually paired with computer game consoles, which are placed near the worker and capture a 3-D skeletal character animation of the user. Ergonomists use the data to help employees align their posture correctly. Measurements captured by the system, such as an employee’s height or arm length, are used to design workstations that better fit employees. Ford is considering further rollout to its other European manufacturing facilities. The company has worked since 2003 to reduce the injury rate for its employees through worldwide introduction of ergonomics technologies and data-driven process changes.